The Anderson Tapes (1971) co-starring Dyan Cannon, Martin Balsam, Alan King, Christopher Walken, Margaret Hamilton, and Conrad Bain. The Molly Maguires (1970) with Richard Harris, Samantha Eggar, and Anthony Zerbe. The Man Who Would Be King (1975) with pals Michael Caine and Christopher Plummer. Throughout his up-and-down marriage to Diane Cilento, Connery's name had been linked with several other women. During a 1970 golf trip to Casablanca, 6'2" Connery met 5' Moroccan-French painter Micheline Roquebrune, a married mother of three. 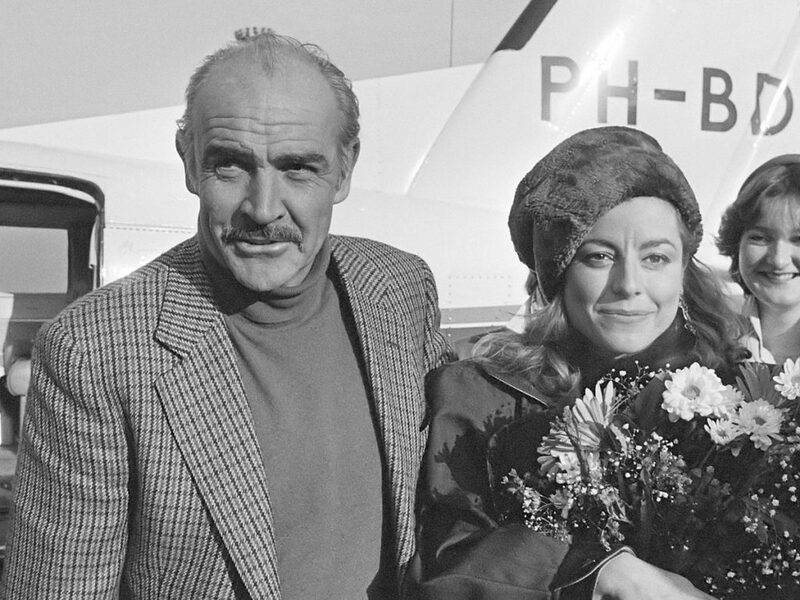 After Connery and Diane Cilento divorced in 1973, Sean Connery and Roquebrune married. The couple primarily lived in Spain with her three children after their marriage. Murder on the Orient Express (1974) cast included Albert Finney, Lauren Bacall, Ingrid Bergman, Martin Balsam, Jacqueline Bisset, John Gielgud, Anthony Perkins, Vanessa Redgrave, Richard Widmark, and Michael York. Sean Connery starred in the sci-fi feature film Meteor with Natalie Wood, Henry Fonda, Joseph Campanella, Karl Malden, Martin Landau, and Brian Keith. A 50+ Sean Connery starred as 007 Bond for the last time, in the independently produced Never Say Never Again (1983), based on the Fleming novel Thunderball. 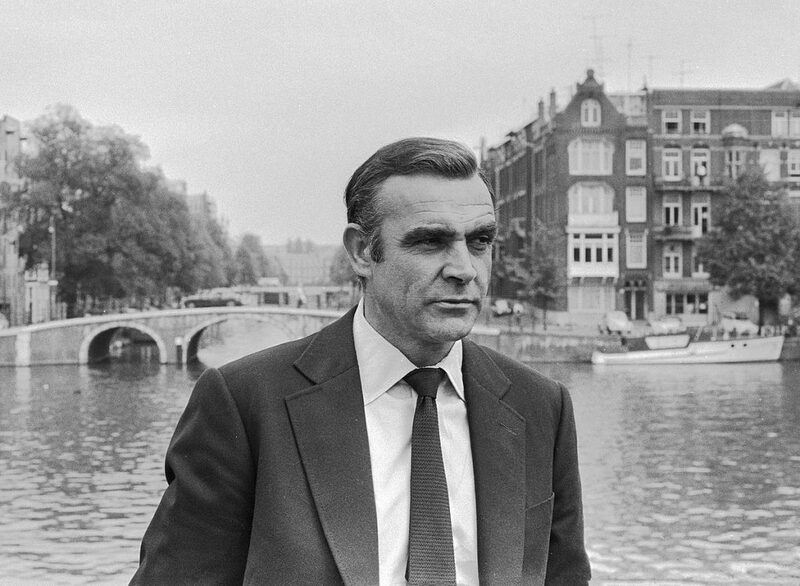 The film's title Never Say Never Again is supposedly a reference to Sean Connery's having said he would never again play Bond upon completing filming for 1971's Diamonds Are Forever. The movie trailer for Never Say Never Again (below) features Sean Connery, Barbara Carrera, Kim Basinger, Klaus Maria Brandauer, and a shark. 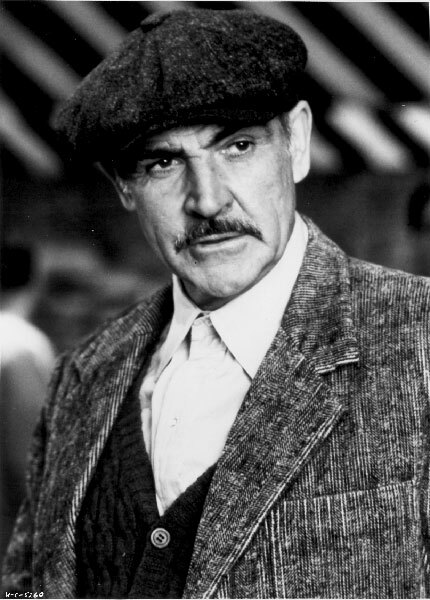 Connery took a two year break from filming movies before starring in The Name of the Rose (1986). He won a BAFTA Award for his performance in The Name of the Rose. The Untouchables (1987), for which he won the Academy Award for Best Supporting Actor. Co-starring with him in The Untouchables were Kevin Costner, Robert De Niro, Charles Martin Smith, Andy Garcia, and Patricia Clarkson. Indiana Jones and the Last Crusade (1989), supporting Harrison Ford and a cast that included Denholm Elliott and John Rhys-Davies. The Hunt for Red October (1990) was a co-starring vehicle for Sean Connery and Alec Baldwin. Among the large supporting cast of The Hunt for Red October were familiar faces Scott Glenn, Sam Neill, James Earl Jones, Joss Ackland, Peter Firth, Tim Curry, Courtney B. Vance, Stelland Skarsgard, Jeffrey Jones, and Fred Dalton Thompson. The Russia House (1990) paired Sean Connery with Michelle Pfeiffer and Roy Scheider. Their castmates included John Mahoney, J. T. Walsh, and Klaus Maria Brandauer. The clip below from The Russia House features Sean Connery and Klaus Maria Brandauer. He was voted People Magazine's Sexiest Man Alive in 1989 at age 59 - evidence that for some people, you get better as you get older. In 1995, the same year Sean Connery became a senior citizen, he was listed by Empire magazine as one of the 100 Sexiest Men in Film History; and turned down a very lucrative offer to appear in the fantasy The Lord of the Rings movie trilogy, saying he didn't understand the script. People Magazine named Sean Connery the Sexiest Man of the 20th Century in 1999. He was knighted in 2000 after two previous nominations were unsuccessful, likely due to his support of the Scottish National Party and the campaign for independence. "Fed up with the idiots...the ever-widening gap between people who know how to make movies and the people who greenlight the movies." Connery paid a penalty to get out of a contract to write his autobiography with a ghostwriter. 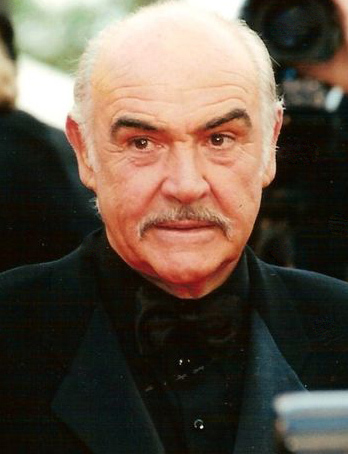 In 2006 after receiving the AFI's Lifetime Achievement Award, Sean Connery confirmed he was retiring from acting. He subsequently turned down the opportunity to do a cameo reprising his role as Indy's father in Indiana Jones and the Kingdom of the Crystal Skull, saying he was enjoying his retirement too much. 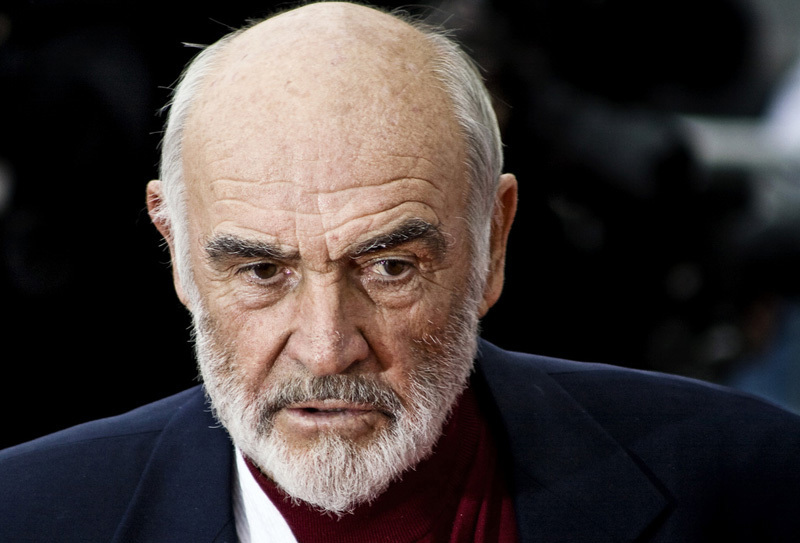 In a 2007 Movies.com poll, 77-year-old septuagenarian senior citizen Sean Connery was named the World's Sexiest Senior, beating out Al Pacino, Robert DeNiro, Jack Nicholson, and Harrison Ford. Despite his "retirement", Sean Connery did later perform a voice over acting role in Sir Billi (2012), an animated movie which he also executive produced. Connery and Micheline have lived in the tax-sheltered Bahamas since 1998; they also have a villa in Greece and share a helicopter platform there with their neighbour, King Willem-Alexander of the Netherlands. They are grandparents to his actor/director son Jason Connery's son Dashiell, born in 1997. Happy 85th Birthday, Sean Connery!